As per the information provided by the Pondicherry University, students would be allowed to apply for admissions to MBA courses based on their CAT score. 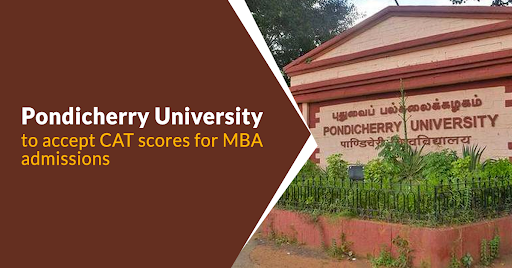 Earlier, Pondicherry University used to conduct its own entrance exam into its management program and the admission to the course was based on the individual score obtained by the candidate. Those who wish to get enrolled for MBA courses in the University must appear for the Common Admission Test (CAT) 2018 exam which is to be held on 25th November. CAT is a well-recognized national level exam which is conducted by IIM in 147 centers across India. It is a culturally-diverse larger pool of applicants selected across the length and breadth of the country which is essential in enhancing the MBA education experience of all the students and also benefits them by improving the placement potential. Students have to reach to the CAT Cutoff score for seeking admissions in the best B-Schools. IIM has started the registration process for CAT from August 8 and it will remain open till 5 pm on September 19 this year. The total amount to be paid for the registration process for CAT is INR.1900 for General Category students, whereas it is INR 950 for SC/ST and PWD students. Admit card would be available for download from October 24. IIM will be tentatively announcing the results of CAT 2018 in January 2019. Since CAT scores are valid only for a single year, therefore, students have to bear that in mind that they apply to management colleges accepting CAT within that year. Beginning this year CAT is pre-requisite for admission in Pondicherry University and that’s the reason candidates are asked to download the copy of the CAT scorecard and keep it handy when appearing for MBA admissions at Pondicherry University. The original copy of the scorecard will have to be produced to the Department of Management Studies at the University during the time of shortlisting candidates for admissions in the next academic year. As per the guidelines issued by the university, the selection process for the academic year 2019-2021 will be almost identical as most post-CAT processes which include Group Discussion and Personal Interview and is slated to be organized in the third week of March 2019. Candidates who wish to get detailed information about the entire process and information related to Pondicherry University management program can download the ‘MBA 2019’ brochure from the university’s official website. The management department of the university offers various specializations like Finance, Information Systems, Human Resources, Marketing and Operations among many other popular courses. Being the first academic unit of the Pondicherry University, it is quite popular among the students.